After waiting months at a time for an XRG-1 Reentry Glider to come up on ebay (and watching the few that did go for $200 or more) I decided Major Matt needed something different. The design criteria were simple: it had to fly with a figure in the cockpit and it had to look cool (and be easy to build with inexpensive materials). 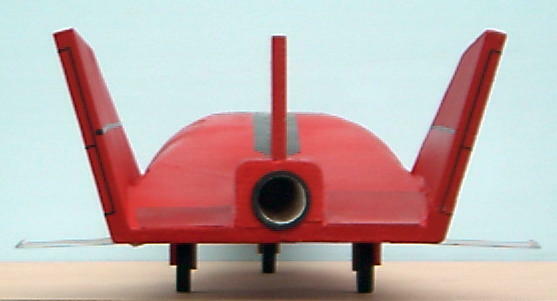 Lacking any injection molding equipment, the new glider would have to be solid as compared to the XRG-1 plastic shell. Balsa wood and styrofoam are light and easy to work with but they are brittle and not very strong. Remembering the crashes that my childhood XRG-1 experienced, I knew that the wings would be the first casualty. 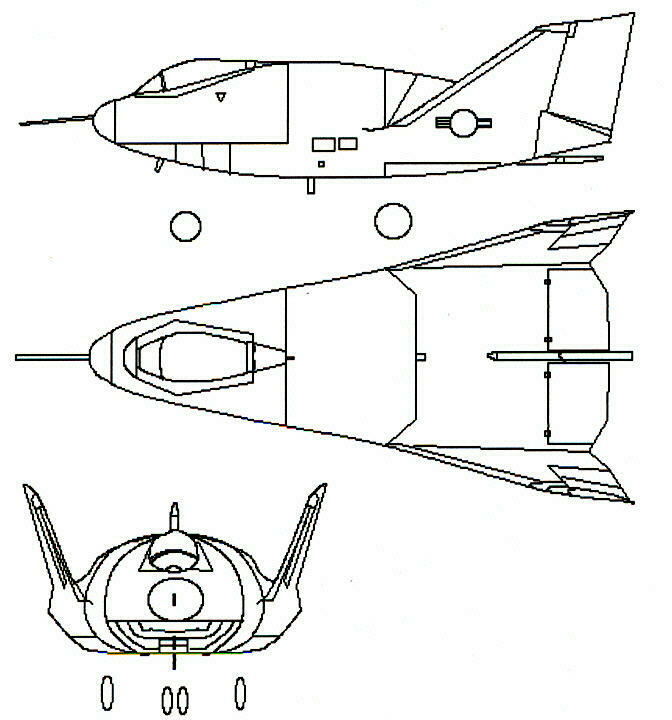 This led me to consider a wingless glider also known as a lifting body. 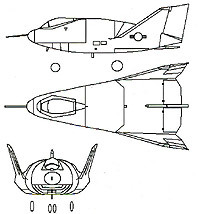 Several lifting body designs were tested at Edwards AFB in the late sixties as part of the USAF/NASA program that led to the development of the Space Shuttle. I chose the X-24A. 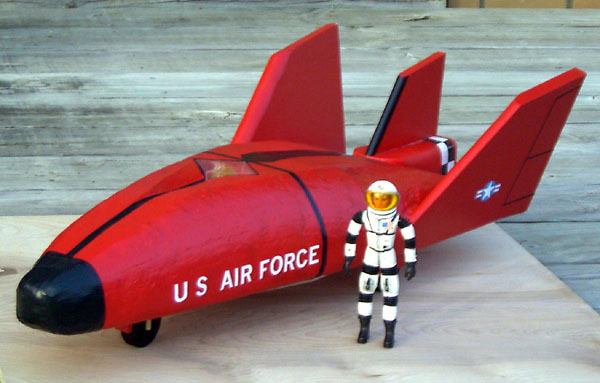 The X-24A was the basis for the X-RV seen in the 1969 movie "Marooned" and the recently (unfortunately) cancelled X-38 which was to be the Crew Return Vehicle from the International Space Station. I printed out a three-view sketch of the X-24A from the internet and blew it up on a copier until it was the same 1/12 scale as the Major. The glider is about 24" long and 12" wide. You may notice some differences between the finished glider and the three-view sketch. The bottom is flatter and the pilot's canopy is flush (think about it: if you're coming back from orbit, would you really want your head sticking out like in the XRG-1?). The finished glider more closely resembles the X-RV (I also wanted to distinguish it from the white and black color scheme of the XRG-1 and the Space Shuttle). SIG Manufacturing sells "Flite Foam" styrofoam blocks for model airplanes. I bought a 4" x 12" x 48" block for about $12. The plan was to transfer the side elevation of the X-RV to the 4" high side and cut it with a bandsaw. However, my bandsaw wasn't large enough to cut all the way through the 12" side so I cut the block down the middle leaving me with two pieces 4" x 6" x 48" each. Having two pieces would require cutting the side view twice but it made hollowing out the cockpit and what I call the launch chamber much easier. About the launch chamber: I realized from an earlier prototype that it would be difficult to hand launch the glider so back to the internet I went and found a lot of information on potato cannons. This seemed like a good way to propel the X-RV so I built one. The launch chamber is a plastic plumbing tailpipe (sealed at one end) purchased from Lowe's for about $2. The OD of the cannon barrel is slightly smaller than the ID of the tailpipe. When the cannon is ignited, the gases expand and send the tailpipe (and the X-RV) on its way. Once the hollowing out was complete, I transferred the side elevation to the 4" side of each block and cut it with the bandsaw. I then used Elmer's glue to assemble the two halves. The next step was to transfer the plan view to the top of the assembly and cut out the plan view. It was starting to look like a lifting body except that the front elevation was rectangular instead of rounded. 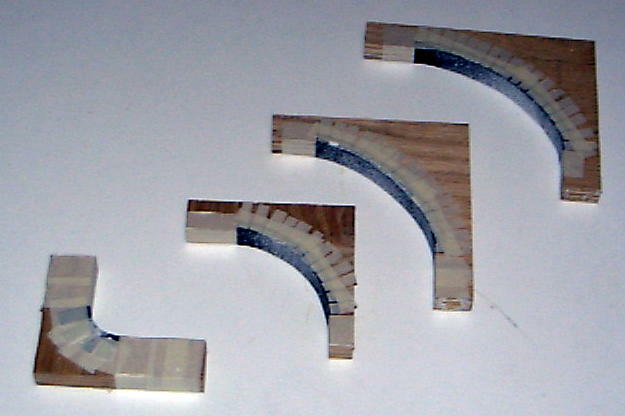 Next I cut several pieces of plywood into curved shapes and covered them with sandpaper. I used these tools to round off the corners. The sandpaper left a few gouges in the Styrofoam that later had to be filled in with spackle and re-sanded. But I decided to leave the surface a little rough since this craft has been traveling back and forth from space for thirty years. Compare the front elevation of the finished glider with the blue prototype (the prototype was made from foam board insulation that is more durable but also heavier and harder to shape). I cut slots in the body, attached the angled side fins and sanded the joints. Spackle was again used to blend the fins into the body. The next step was to seal the styrofoam before painting. It is VERY important to seal the styrofoam because there are components in spray paint that will eat up styrofoam. I chose Elmer's glue again because it's cheap, easy to work with and would also toughen up the skin. I put two coats on the top of the X-RV and three coats on the bottom. 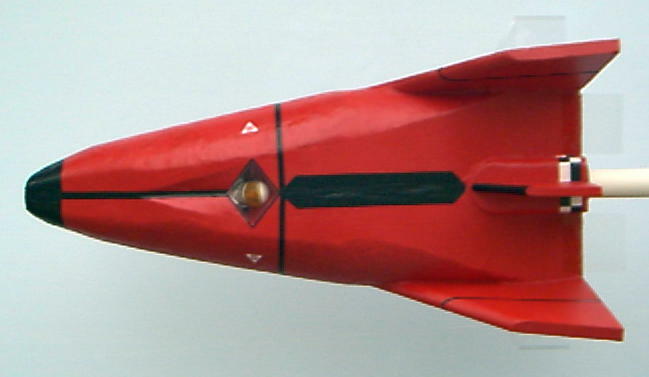 I then painted the X-RV a dull red as seen in the movie "Marooned" and added decals that I created on my computer. I also added black electrical tape to the nose to toughen it up for the inevitable crashes. Major Matt slides into the cockpit and the canopy (which is a folded plastic sheet) snaps into the diamond-shaped opening. 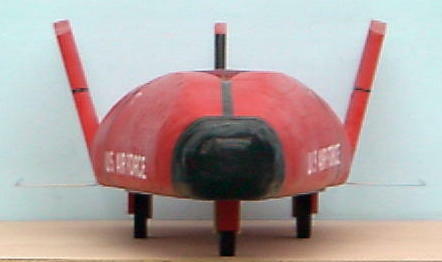 As shown in the picture, the X-RV slips onto the barrel of the cannon. The X-RV glides about 60 feet when fired from waist high (3 feet). The first few flights were with no wind and there were no problems. After a slight cross-wind caused a crash, I decided to add small horizontal fins toward the back to prevent rolling. The ones on the prototype are thin cardboard. The ones on the X-RV are transparent plastic and can be removed for display. Here's a link to a good potato gun site http://www.borked.org/~wax/graphic.potatogun.html. My cannon has a 1" barrel and a 2" combustion chamber. I use Right Guard as the propellant. The decals were created with Lotus Freelance or downloaded off of the internet and printed out with Lotus WordPro here. Sorry about the format, I'm working with John to produce a file that can be viewed/printed by anyone.